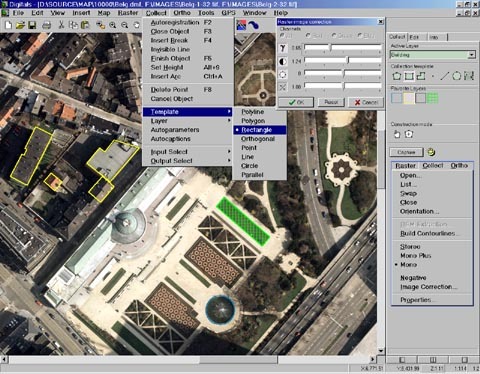 Provides creation/revision digital maps and orthophotos from raster images. 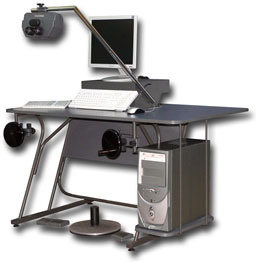 The photogrammetric station is based on a standard Intel-compatible computer working on Windows 98/ME/2000/XP system. The software supports video modes from 1024x768xHiColor to 1600x1200xTrueColor. Can work with stereoscope (split screen mode) or OpenGL 3D-shutters (page flipping mode). The station provides a fixed floating mark and scrollable images in split-screen mode; this functionality does not require any special hardware support. Users can move the floating mark with a classic handwheels/footdisk combination and/or with the mouse. Stereoscope or stereo shutter glasses can be used for observation. One micron encoders and 3D digitize with subpixel accuracy. Online coordinate exchange with other programs via TCP/IP or COM-port.